Mor Khazgur is an Orc stronghold in the far northwest of Skyrim, west of Solitude and north of Markarth. The stronghold owns and operates an orichalcum mine containing seven ore veins. Notable NPCs found here include Chief Larak, a master trainer in the Block skill, and Borgakh the Steel Heart, a potential follower and potential Blade. 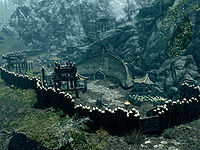 There is just a single entrance to the stronghold's compound near the northern edge of the surrounding palisade. There is a small vegetable patch immediately on your right upon entering, which contains eleven cabbages, eleven leeks and eight potato plants. On the left is a lookout tower, while in front is a tree stump that has a mora tapinella fungus growing from it. Behind the vegetables is an open-sided hut, beneath which is an unlocked chest and a rack hanging from the ceiling holding a garlic braid and pheasant. The path leads past the longhouse, passing a wooden table and chair on the right where Chief Larak is generally found sitting. Beside this is a rack holding three whole salmon. On the other side of the entrance to the longhouse is a practice dummy where Borgakh the Steel Heart is normally found training her skill-at-arms. Opposite the longhouse entrance is a second open-sided hut with an alchemy lab beside it and a set of shelves under it. These hold an apothecary's satchel, two random potions of stamina, a sample of fly amanita and a sample of white cap fungi, two purple and a red mountain flower. Continuing past the longhouse there is a covered stack of food barrels on the right with a trapdoor leading to Mor Khazgur Cellar beside them. On the left is a second lookout tower, while ahead is a covered blacksmithing area consisting of a forge and grindstone, with a set of shelves at the rear holding a random enchanted Orcish battleaxe, a copy of the Smithing skill book The Armorer's Challenge, three owned orichalcum ingots, a steel sword, an enchanted Orcish sword and an Orcish helmet and shield. The path continues up and around, passing a second tree stump with mora tapinella fungus growing on it. Further up it passes between another lookout tower and a smelter to the top where Mor Khazgur Mine is located. On the right of the entrance are some more food barrels and three non-respawning orichalcum ingots. Like all other Orc strongholds, to be welcomed into this stronghold and able to barter with the residents requires that you be Blood-Kin to the Orcs. You can gain access by climbing the mountain and coming back down over the stronghold, but you will still be challenged as you approach the gate, and offered a quest opportunity. Mor Khazgur also appears in ESO. This page was last modified on 25 February 2018, at 18:47.